The Beach in Pourville is a painting by Claude Monet, the French impressionist. It is a small oil on canvas painting, measuring just 23.62 by 28.74 inches, executed in 1882. It belongs to the Polish National Museum in Poznan. In September 2000, the painting was cut from its frame in the National Museum. The thief tried to delay the discovery of the theft by replacing the painting with a copy done on cardboard. Polish police recovered the painting ten years later, and returned it to the Museum. Although Monet is probably best known for his horticultural paintings, he produced many works influenced by his surroundings. The artist spent the winter of 1882 in Pourville. He enjoyed the time spent there and returned with his family the following summer. 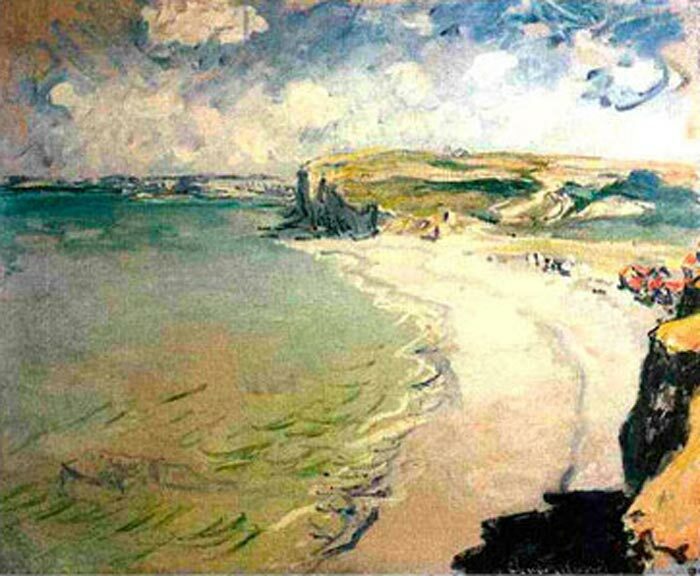 The Beach in Pourville is one of the paintings he created there. The painting depicts the deserted beach with cliffs at either end. About two thirds of the painting is taken up by sea and sky.